Another calm week. It’s been welcome given the last two years of my existence. Last year I was trying to take it easy, and yet I still found myself entrenched in activity. This year has been a welcome change to try to relax and reflect on my life and my relationships to people in my life. Sunday became an impromptu cooking night despite some inclement weather. 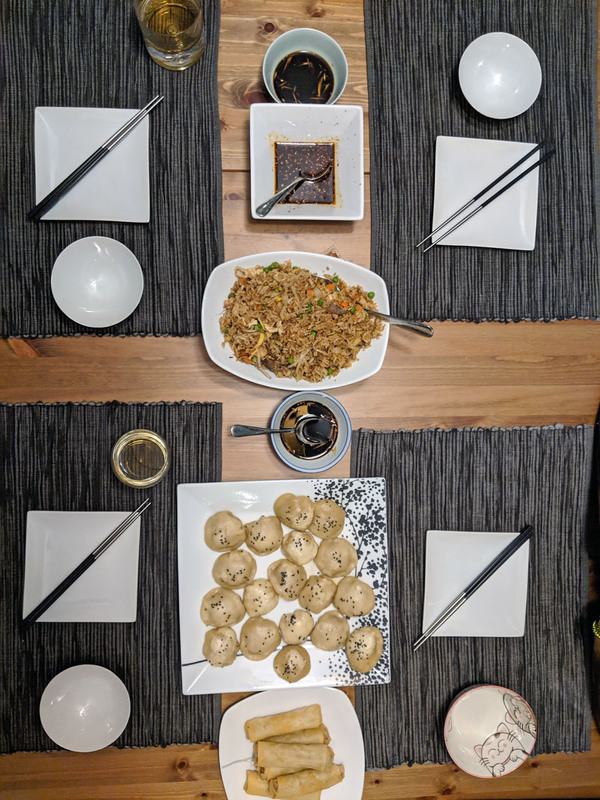 Ben and I had been talking about soup dumplings since I found a video a week ago. We decided to get together Sunday and make some delicious food. We pan-fried some of them and steamed the rest. Ben wanted to make a clear wrapper dumpling with veggie filling which was also delicious. It was a fantastic night, and we all learned some new skills and had some new experiences. Other than dinner it’s been a pretty quiet week. James and I got to hang out as well. In rebellion against the weather we went out and got some drinks and caught up. Despite working together, we don’t really get to talk much and I always enjoy sharing some brews with him. He’s good folk. Eventually his wife came and joined us and the three of us shared in a wonderful exchange of conversation, drinks, and camaraderie. I don’t see them nearly enough.